In honor of St. Dionysius the Aeropagite who wrote down what his teacher the Holy Apostle Paul told him of what he learned during his vision of the third heaven (2Cor 12:2). Angel Ring brings together sites with a common interest : ~ Angels ~. 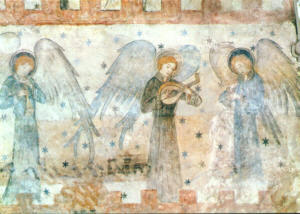 These sites offer the very best in angelic art, music, information, stories and discussions. Eine umfangreiche Linksammlung mit vielen Bildverweisen.